Venice’s Arsenale holds a unique place in the prehistory of the Industrial Revolution. Although Henry Ford sometimes gets credit for inventing the assembly line, the Venetians were using the same methods 500 years earlier to produce not only more and better ships than anyone else, but fat galleys and long tapered galleasses (the bane of the Turks at Lepanto) that were as identical as Model Ts. As a result, all Venetian ships used uniform spare parts, which were available at any Venetian port; all ships could quickly be adapted to either war or trade (‘trade war’ in the Middle Ages being more than mere metaphor); all ships could be boarded by any Venetian crew, who would immediately ‘know the ropes’, so to speak. 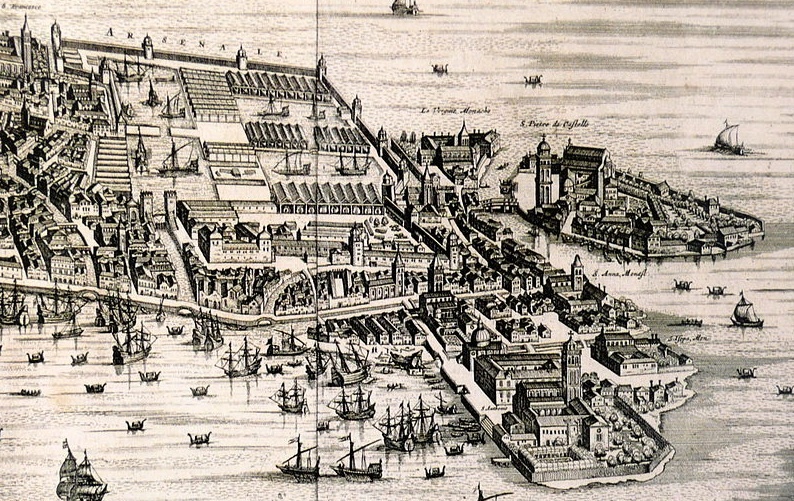 According to the last speech of Doge Mocenigo in 1423, the Arsenale employed 16,000 men, by far the most ever employed in one place before the 19th century. During the most intensive fighting with the Turks it cranked out a ship a day; on special occasions, to impress visitors like Henry III, King of France, the arsenalati produced a beautiful galley between the antipasto and dessert courses of a State feast. Dante visited this great complex twice and, as Blake would later do with his ‘Dark Satanic Mills’, relegated it to the Inferno, where its cauldrons of boiled pitch came in handy to poach crooks who sell public offices.